A friend of mine picked up a Squier strat body and neck with a few pieces of hardware included…and then proceeded to give it to me! And, if I dig through all my spare parts from other projects I can put together a complete guitar with just the purchase of some pick ups. Not bad for a free project guitar! But then I start thinking…which always gets me in trouble. I start thinking about what I could do with this guitar. Instead of getting the traditional 3 single coils, why not get some mini-humbuckers. That would require a new pick gaurd. And since I’ve got to buy pick ups, I might as well get some decent tuning machines. And then I should get a new Tusq nut and string saver saddles for the bridge. And while I’m at it, why not make it a hard tail? And I really don’t love the blue because it looks too purple to me, so I could repaint it or decoupage it like my Wolverine guitar. But is all this worth it? Is this even solid wood? It looks like solid wood, but what kind and what quality? And do I really need another strat project guitar? I already have the black Squier strat I got a while back that is in working order. And I recently decided not to get a black and chrome Squier strat for similar upgrades or flipping. And why am I so interested in a dual mini-humbucker or dual humbucker hard tail strat? Because they are cool! Hey, wait a minute, I’ve got one of those! A really nice one! So maybe I need to reevaluate what I’m doing here? Am I playing the guitar or am I just amassing equipment and projects? Am I spending more time on projects and not actually using the equipment I have to its full potential? Add to all these questions a recent post by New.Old.Stock and I am really in need of setting proper priorities. So how about you? What are your guitar priorities? Are you modding equipment, buying lots of stuff, and spending all your time online? Or are you working on getting better at making music with what you’ve got? 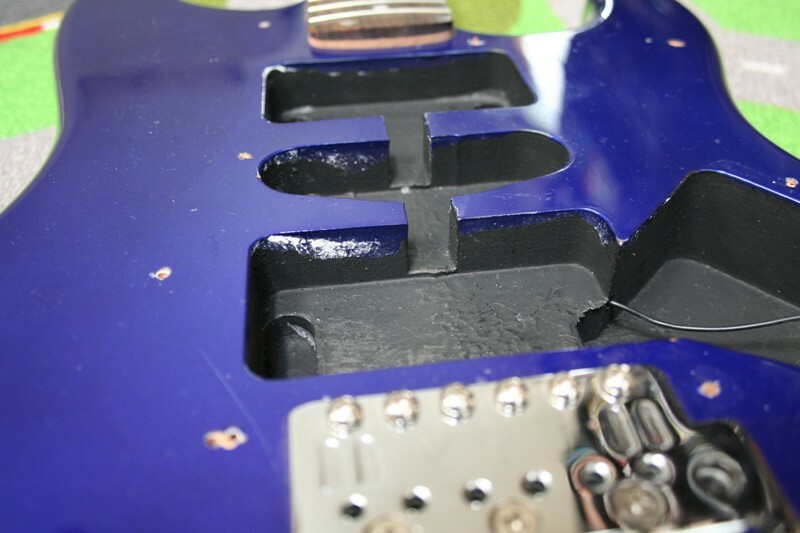 This entry was posted in Building/Mods, Guitar, Practice, Purchases, Wanna Be by gtr1ab. Bookmark the permalink. You got a free guitar, so I see no harm in starting a new project 🙂 I definitely don’t always practice what I preach, especially when it comes to gear. I really like hardtail strats, but that might be a complicated conversion. Agree though that the blue is a little intense. And the minibuckers concept is really cool! I’ve thought about triple minibuckers or even triple humbuckers, but I find myself hitting the middle pickup on my single coil strat guitars often enough to be distracting. I really like that single coil strat sound (and often use my middle pickup to eliminate hum), but for my playing I always prefer no middle pickup. It may sound indecisive to a fault, but the whole concept of the 3 minihumbuckers still interests me after all that “middle pick up annoyance” discussion. The nice thing about this blog is that I can vent and explore what I want to do out loud and then real life is a little bit calmer and a little bit easier. What I’ve got to do is prioritize what I can do and when. That’s why I appreciated your blog entry. It was a great reminder of what is important and I really liked how you approached the entire concept. Oh, and thanks for the chance to vent. I feel better already! Just re-reading that comment…my wife’s annoyance with all this guitar stuff just made a lot more sense! She’s got to listen to me whine (as well as see the piles of gear) all the time. And listen to my hack job at actually playing the guitar! ha! What if what you really love are the projects and the playing of the instrument is really the excuse to justify the guitar modding? That statement is just too close to the truth. But I also do enjoy playing. I do really enjoy playing with other people, but that is rare and far between event. I’m not going to stop, but I am focused on finishing what projects I’ve got lined up before starting new ones. Plus, modding must have a purpose. Otherwise it really would feel like a waste of time. And instruments are meant to be played. Thus, I need to play in order to provide purpose to the modding. I used to wonder why certain famous guitar makers were guitar makers and not players. Paul Reed Smith and Bob Taylor make guitars. They also play guitars. But they are not known for their playing. I’m not saying I’m a Paul Reed Smith or a Bob Taylor. But I understand how that happens much better than I did when I first started modding a guitar so I could play the guitar (had to build Wolverine).